The other day, with the help of my friend Wayne, I “harvested” and packaged my first ever attempt at homemade capicola, a delicious dry-cured Italian cold cut made of pork shoulder and the perfect blend of seasonings and wine. As we were running our hunks of meat through the Food Saver, we were noting how difficult to it was to slice the pieces that probably should have been taken down a few weeks earlier. After we were done packaging (and tasting) the capicola, Wayne told me that what you really need is a good sharp knife. Now, don’t get me wrong, as a lifelong foodie we have decent knives at home. Our wooden knife block and knife drawer, contain some Wüsthof knives that are nearing the twenty year mark and one Henckels paring knife I picked up at Woodbury Common Premium Outlets years ago. The Wüsthof aren’t high-end knives, they are the affordable starter set. While they have served us well over the years, they aren’t top of the line. Between Christmas and my birthday at the beginning of the year, I maintain a pretty good Amazon wish list. I had heard about Global knives being a good kitchen knife and had it on my list with the hopes that someone would gift it to me. As of the night in question, when I desperately needed to be able to slice my capicola, I had not received the knife I had wished for. With a bag full of capicola in my back seat, I headed to Bed, Bath & Beyond with the intent to purchase a good, sharp knife. I looked at the Shun and the Global knives, known for their sharp blades. Then I held the Zwilling J.A. Henckels Pro 6″ Chef’s Knife in my hand. It was a little heavier, the handle felt a little more comfortable and the blade was the right size with a nice curved end, perfect for chopping and multi-purpose use. And this baby is sharp! Wowza! 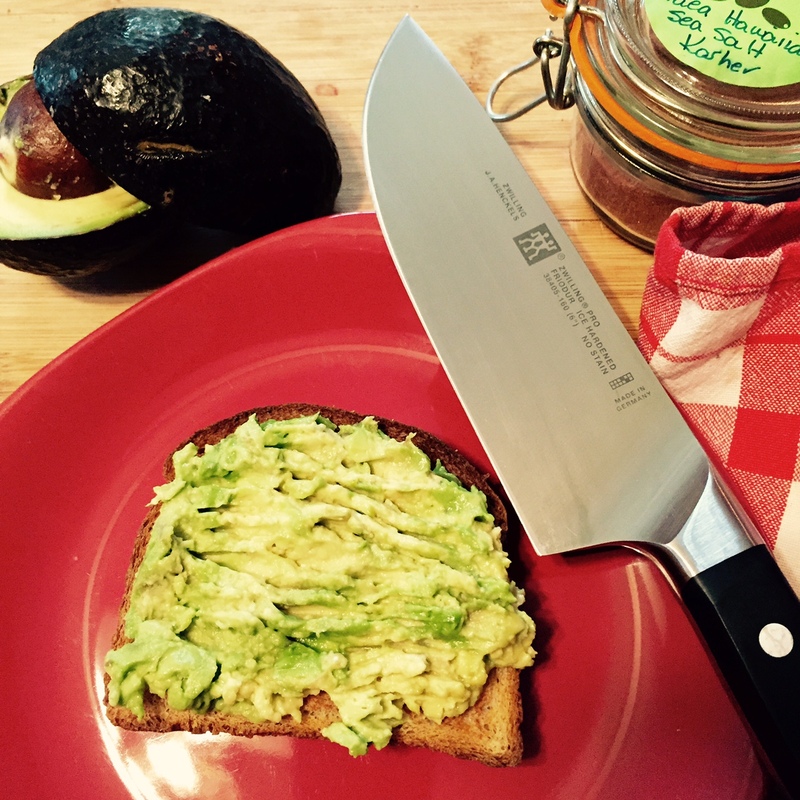 My fancy new Henckels Pro knife contributed to today’s healthy lunch: smashed avocado on low-calorie wheat bread with a sprinkling of Hawaiian pink sea salt! Yum!